Endometriosis is when the cells that normally line the uterus are found outside the uterus. When during a woman’s menstrual cycle those cells are shed from the uterus and menstruation begins, these other misplanted cells are also signaled to bleed, and that causes inflammation wherever they are. These cells can be anywhere in the pelvic cavity and can also adhere to the intestines and even travel up to the chest cavity in more severe cases. So endometriosis can cause all kinds of pain. How Do You Know if you have endometriosis or just bad periods? Severe stabbing pain especially before or during menstruation. Getting very sick with the menstrual cycle such as fever and chills, vomiting, etc. The only way to definitively diagnose the disease is via laproscopy, which is sneaking a camera in the abdominal and pelvic cavities to look for the implanted endometrial cells. Many women find out they have endometriosis when they have difficulty conceiving. This is because the continued bleeding of the misplanted cells can cause scar tissue and adhesions to build up, and often on the ovaries and/or fallopian tubes. This blocks the pathway for both egg and sperm. There are two main ways medical doctors will treat endometriosis. One is with surgery to either cut out the adhesions or to remove tissues or organs affected. The other is the use of hormonal birth control containing synthetic progesterone called progestin. This counters the effect of estrogen which is the hormone that causes the endometrium to grow. There are some negative possible outcomes with either drugs or surgery. Hormonal birth control often creates side effects and risks such as blood clots, weight gain, or mood changes. Likewise, serious problems with surgery include the adhesions growing back or scar tissue building up. Often doctors recommend a hysterectomy, and understandably a woman may oppose this level of invasiveness. Even with removal of the uterus and other tissues, endometriosis can still grow back in other tissues and areas. Some women prefer to seek other options to hormonal drugs and surgery. Acupuncture and herbal medicine have been used for many centuries to relieve menstrual pain, abdominal pain, and to improve hormonal imbalances. Acupuncture and Herbal Medicine work to uncover the root causes of why a woman is having pain, heavy bleeding, etc, all the symptoms she experiences as part of her endometriosis diagnosis. We as practitioners will examine the pulses, abdomen, and tongue, as well as ask many questions about the quality of the pain, blood, bowel movements, etc, to get a whole picture of what is not working right. According to Chinese Medicine, most women with endometriosis have a form of what is called Blood Stasis, or Blood Stagnation. In our medicine, refers to a poor quality of blood that is too thick or not fluid enough, and blood that is not free flowing througout the body and especially that gets obstructed in the uterus. While these terms do not mean that there is something wrong with your blood according to conventional medicine, it refers to the way Chinese Medicine views the Blood as a grouping of functions in the body. Once the Chinese Medical Diagnosis is determined, we can then ascertain which treatment approach to take. For instance, if we determine the blood is stagnant, we may use herbs that invigorate the blood and points that promote circulation. A treatment plan can be anywhere from 3 months to 9 months depending on the severity of the case. Many women experience significant reduction of pain and bleeding and improved cycles with acupuncture and herbs, and often have noticeable improvements within the first few treatments. Here at Energy Flow Health, we support a woman’s decision, as we honor that a woman knows her body best. It is helpful to explore the options, and if something isn’t feeling right then you always have the right to try something else. There is hope, and if you would like to discuss working with Amy, please call 630-335-1069 for a complimentary consultation. How does Chinese Medicine treat Hormonal Imbalances? As you can tell from my tagline I specialize in digestive and hormonal imbalances. So one may wonder, how does acupuncture affect hormones? Since Chinese Medicine originated thousands of years ago, the perspective of human physiology was conceived and understood under different terms and points of reference. Then, there was no traffic, no TV, no internet, no central air or furnaces, no high-tech medical equipment. But imagine. People were really close to nature. Really in tune with the forces of nature surrounding them. So every nuance of biology was more heightened. Everything was interpreted through nature. Not separate. As a result, they discovered the spaces between the muscles, bones, nerves, and blood vessels contained a special intangible force, and that by inserting thin objects into these spaces at specific points, the “energy” or “qi” in these spaces or “channels/meridians” could be affected, and illnesses could be resolved, and immunity could be strengthened. Part of the mystery of our health is in our chemistry, dominated by chemicals called hormones. Hormones are the bosses of our physiology and metabolism. Scientists today are still trying to grasp the far reaching influences and delicate balances of these chemicals. Back to Chinese Medicine – of course people still had these chemicals back then, but they were seen more holistically, and incorporated into the explanations of the functions of structures that could be seen (unfortunately mostly due to war when people’s guts literally were spilled out). 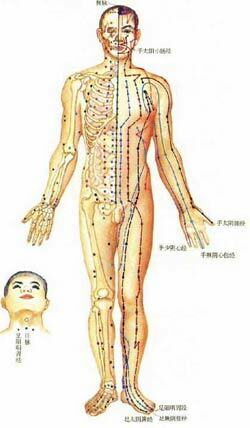 So to summarize, in Chinese Medicine we explain most of our physiology in terms of functions of a number of systems. Each system has associated organs, senses, meridians, colors, emotions, flavors, directions, seasons, etc. And more importantly, herbs and acupuncture points that influence these systems. how does acupuncture, and for that matter, herbs, affect our hormones? Hormones, being very minute microscopic, can be considered to be a part of the channel system in the body, and therefore part of our life energy aka Qi. This means by manipulating the channels and organs in the body with energetic means, we can affect how the hormones work. Health is perfect balance right? Blood and other fluids flowing unimpeded through the body, carrying nutrients to and waste products away from every cell, regeneration of cells, and lack of blockages. This is what acupuncture and herbs do. They work to dissolve blockages, encourage appropriate regeneration, and good metabolism of the food we eat so it provides energy to every cell. I know this was a long read, so thanks for slugging through it! I hope it explains the mystery of this ancient yet extremely useful medicine, in a way that makes sense. If not, I’d love to hear your questions – send me a text or call me at 630-335-1069, or email amy@energyflowhealth.com. I hear it all the time: What does acupuncture do? How does it work? 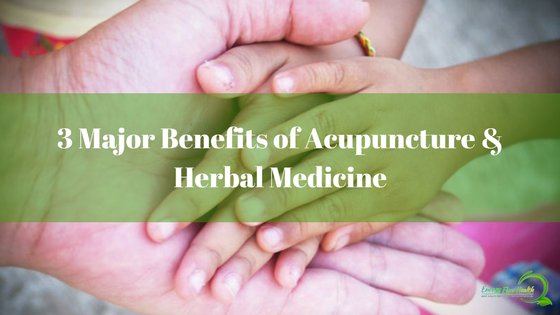 What are the benefits of acupuncture and herbal medicine. Keep reading and I will explain. Really, it’s simple: acupuncture removes energetic blockages that prevent the free flow of our blood and nervous system signals. When we have energetic blockages, signals can’t get through, oxygen and other nutrients can’t reach every cell, waste products can’t be properly eliminated, complex hormonal messages get bungled, and then eventually we get symptoms of pain, brain fog, fatigue, etc. Acupuncture works to free up the flow of energy in the channels of the body, which are like blood vessels and nerves, a complex system of highways, roads, streams, creeks, rivers, bridges, that connect every part of us with every other part. Herbal medicine works on the deeper organ level. It corrects the functioning of our liver system, our cardiovascular system, our lymph system, our genitourinary system, our cognition, and emotions, etc. Together, it’s a complete system of healthcare and does not compartmentalize each body part or each organ. A lot of my patients like this because in conventional medicine there is a different doctor for every body part, but no one is looking at the whole. Chinese Medicine has principles based on natural law, so the whole is accounted for. Still boggled? Still curious? Me too! And so are my colleagues! We marvel at the beauty and amazement of this medicine every day, and never take for granted the grand design of the human organism. But we do love to apply it and see it work! Learn more about acupuncture and how it works here. Also, check out my other post about Positive Side Effects of Acupuncture. Follow me on the social media and ask me anything you want to know about the benefits of acupuncture and herbal medicine! I am happy to help. 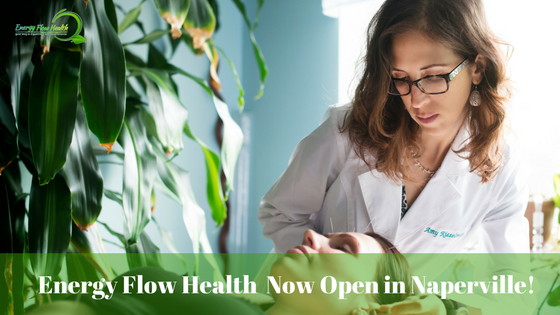 Energy Flow Health Now Open in Naperville! Energy Flow Health Now Open in Naperville! Your Way to Digestive and Hormonal Balance. A little over a year ago, I struck out on my own and created my own practice. I named it Energy Flow Health because we all want more energy and encouraging healthy flow is the way to get it! Now my practice finally has a new home in Naperville! Years ago, I had a dream for my future practice – to be in a wellness center with other like-minded practitioners in a beautiful light-filled space, a whole building, dedicated to helping others to heal themselves, so that we all can go out and heal this troubled world of ours. Then, sooner than I’d imagined, I was introduced to a group that wanted me to join them! I’m so excited to tell you that the doors are finally open at Estuary Center for Living & Healing Arts. The parking lot still needs paving, and the landscaping will come with the spring blossoms, But the beautiful inside is painted and the bed heaters are turned on!! You may be curious at this point: what is Estuary Center? Who is there besides me? I actually came in later in the vision of this wellness center. Several women had begun planning its inception years earlier and became its founding members. They are therapists, psychologists, but mostly healers, like me. Throw into the mix several massage therapists, an art therapist, a Doctor of Integrated Manual physical therapy, and a Functional Medicine Chiropractor and you have Estuary! Together, we’re bringing an invigorating synthesis of mind-body-spirit care. More about the Benefits of Acupuncture and Herbal Medicine in my other blog post here. I hope when you walk through the doors that you will immediately feel cared for and more relaxed, as we’ve designed the space to be a sanctuary and respite. I have appointment times available now throughout the week and am ready to take on new and old patients. Please call me to make an appointment, or if you would like a free 15-minute consultation. Namaste, I look forward to serving you. Please, get in touch with me if you have any questions (630) 335-1069.